Why we need permeability test? Permeability test is necessary on terrain where are predicted soakaways which store water after big rainfall and provide efficient soil infiltration. Usually they are used in areas where surface run-off cannot be disposed into existing sewers or watercourses. 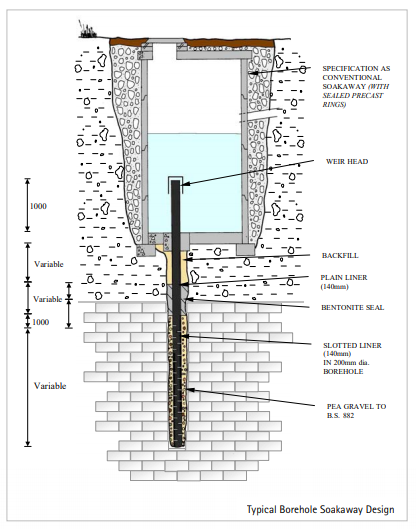 Conventional soakaway – comprises a partially perforated cylindrical or rectangular chamber, which allows the drainage of water into the surrounding soil. 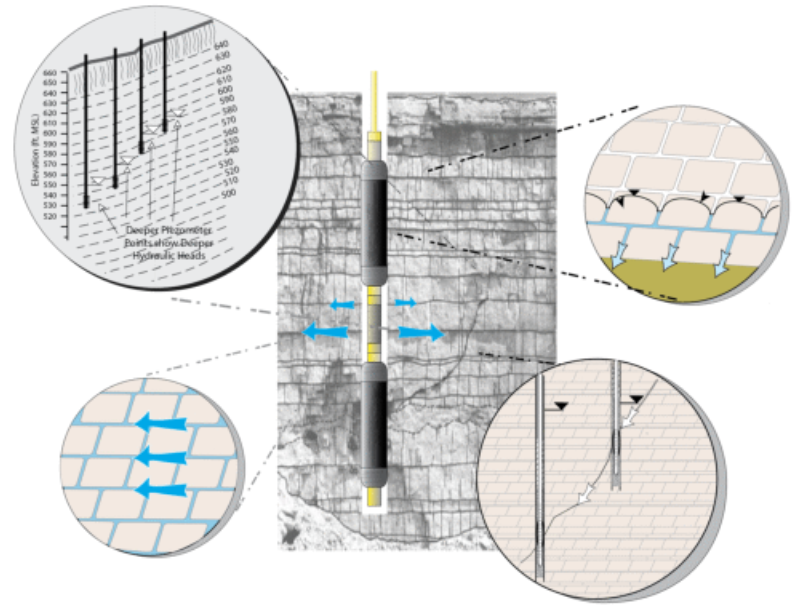 Borehole soakaways – in cases where impermeable soils overlie the permeable strata, the soakage must take the place at depth and so a deep bore liner is used. Here the water is transported from a sealed storage chamber to the soakage medium by a small diameter plastic or steel pipe, again perforated in part. If we want to infiltrate rainfall water at certain location, it is very important to know how much is the soil permeable. Data obtained on small samples in the laboratory may give insufficient reliable data of average soil permeability. And in rock mass the situation is even more complex. Although there are data on the permeability coefficient for certain types of terrain (sandy, gravely or clayey), experience has shown that this value may vary even in terrain with the same type of substrate, so it is necessary to do testing on location. The waterflow which passing through the rock mass depends of some parameters such as: connection of system crack, cracks width, step of cracks filling, filling type and filling erosion resistance during waterflow. 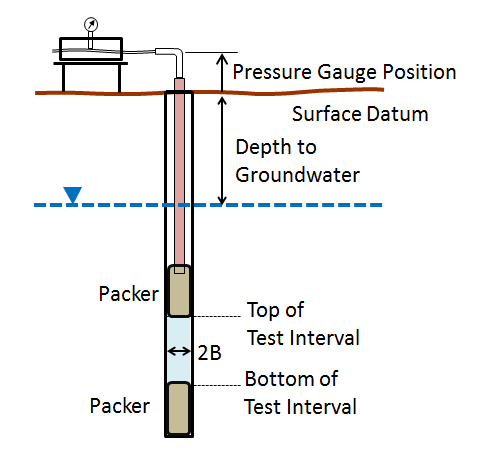 The Lugeon test is an in- situ testing method widely used to estimate the average hydraulic conductivity in rock mass. The test is named after Maurice Lugeon, a Swiss geologist who first formulated the test. Usually, on a certain section of borehole, there are installed packers through which a special pipe brings water under pressure. In the enterence of the borehole pressure is measured with the pressure gauge, and the flow is measured with the watermeter. Test is typically conducted in five steps. At each step, a constant water pressure is applied for a duration of 10 minutes. The gange pressures and recordered flow meter readings are entered into the table. 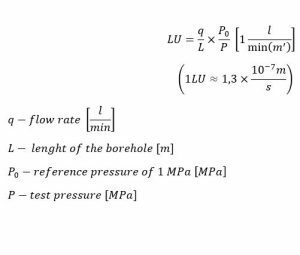 Using the average values of water pressure and flow rate measured in each stage, the average hydraulic conductivity of the rock mass is expressed in terms of Lugeon unit. Lugeon value could also represent the rock jointing conditions, considering a big influence of rock discontinuities condition on value of hydraulic condutivity. 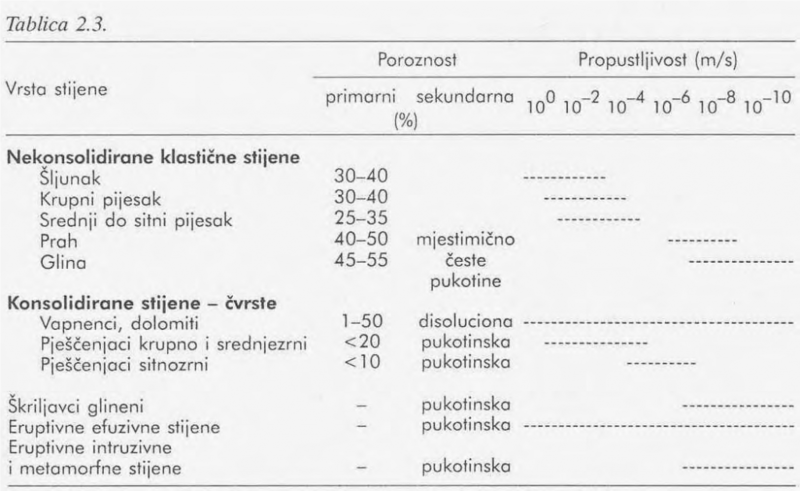 Typical range of Lugeon values and the corresponding rock condition is indicated in the table below. If you have any questions, bee free to contact us!